You can now sign up for the Eastern and Western Region ELHS Spring Meetings! Links to the registration forms can be found below (Adobe PDF reader required to open them). Please get those forms in soon, as the meetings are less than a month away! This year's Western Region Spring Meeting is being held in Marion, Ohio on April 18, 2015. Full details can be found on the Registration Form at the link below. This year's Eastern Region Spring Meeting is being held in Pompton Lakes, N.J. on April 12, 2015. Full details can be found on the Registration Form at the link below. 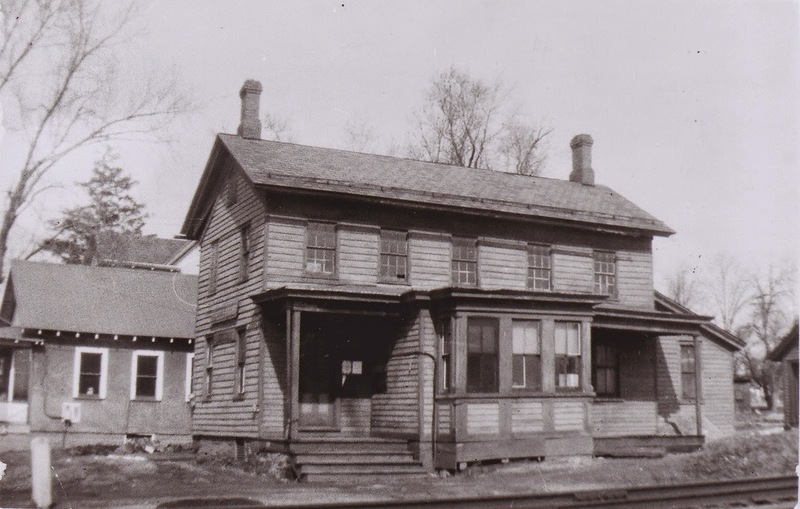 Copyright © 2015 Erie Lackawanna Historical Society, All rights reserved. Another >Proposed< NS 'TRUE Heritage' Unit? Former Erie Lackawanna locomotive engineer Fred Stuckmann made the following suggestion after seeing the NS SD40 recently repainted in a Southern RR scheme (see our post on Friday, March 6,2015), and I think he's on to something. "Maybe they could paint one of the 1700s back into EL, wouldn't that be something?" Electro-Motive built the EL's baker's dozen SD45-2s in November, 1972, just 18 months after building the Southern Railway SD40 that NS shop forces only recently brought back from the dead (literally!) and returned to service in her as-delivered livery (below). There are a half-dozen of the ex-EL Dash-2 brutes on the active NS roster (#1700-1705). 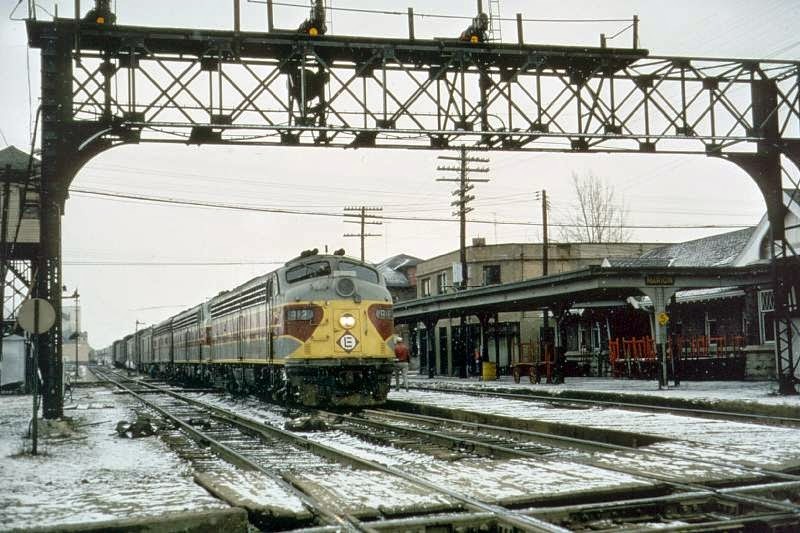 Just as the full Southern freight scheme was not among those to appear on one of the thirty 30th anniversary NS Heritage Units (though the Savannah & Atlanta Railway unit was 'close'), there were only EL predecessors represented (DL&W and ERIE), even though EL was the second largest component of Conrail. While I very much appreciate what NS had EMD do, cosmetically, to both of those new engines, the possibility of returning an active, authentic, 1972-vintage EL six-axle road unit to accurate maroon, yellow and gray presents a tempting goal.Though de-rated from 3,600 to 3,000 horsepower, the three highest numbers (NS #1703-1705) still retain their EMD 20-cylinder 645E3 engines. Two of those NS 1700s, '03 & '05, ex-EL #3679 and 3681 (the latter was the last new locomotive the EL acquired) still have nose class light 'knock-outs' and gaskets, fore and aft, which would enhance the 'EMD as-delivered look', if one were to be returned to EL paint. These six locomotives already have a strong following of admirers in New Jersey and elsewhere. NS could elevate its positive image further, yet again, by leveraging a bit more Good Will with an 'extension' of their Heritage Fleet. 2015 NERPM is May 29-30 in Collinsville, Conn.
Collinsville, Connecticut. We are an NMRA-sponsored event. houses on Sunday, May 31.
www.neprototypemeet.com. There are also photos form past meets. Funaro & Camerlengo, ESU Loksound, Atlas and Rapido. hear from you. I can be reached at neprotomeet@gmail.com. For more information, please visit our website or join us at Facebook.com/nerpm. through various email lists. Thank you. The next stop will be Three Bridges! With Thursday's snowfall now just a bad memory, it was time to head track side for some winter scenes. Because of the snow I decided that Three Bridges (LEHL MP 48) would offer me the best opportunity to get some snow images without my vehicle getting stuck in that snow. It wouldn't be long before NS 22V passed by eastbound with NS 9487 (D9-44CW) and NS 8777 (D9-40C). 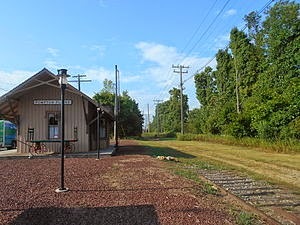 After it passed, I had to wonder just how many trains had passed that old red LVRR Three Bridges depot? The old photo shows that it is still managing to hold its own against time and the elements. 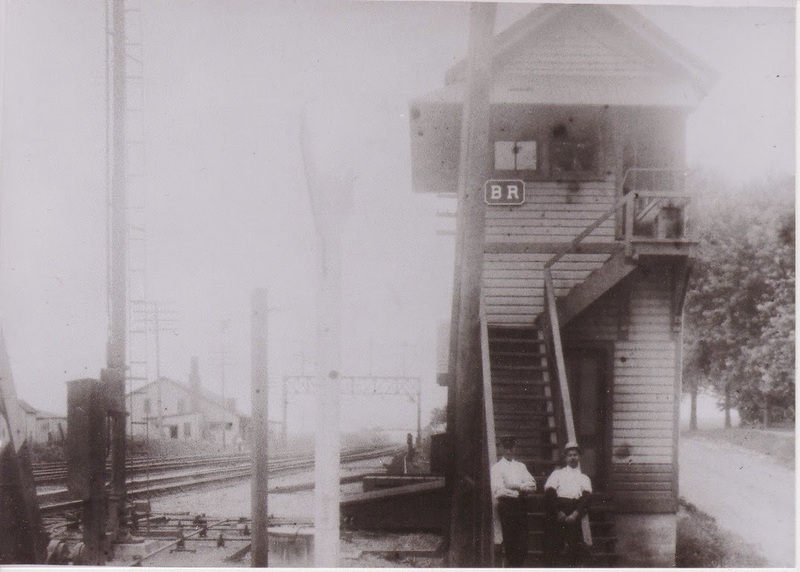 There was also BR Tower, located near the present day NS block signal and adjacent to the Main Street grade crossing. BR Tower controlled the movements on the four tracks that were once here. Note the signal bridge to the left of the tower. That road to the tower's right is Railroad Avenue. Today the only evidence that remains of this tower is a huge concrete slab near that block signal. JACKSONVILLE, Fla. - March 4, 2015 - CSX Corporation today announced that a portion of the Ocala / Marion County Commerce Park in Ocala, Florida has been designated a CSX Select Site. Select Sites are properties identified and vetted as capable locations for future manufacturing facilities along the CSX network. These sites can be developed quickly since standard land use issues and comprehensive due diligence items have already been addressed. "Through the Select Site program, we can significantly reduce the time it takes for companies to evaluate a competitive site, and ultimately construct their facility and bring products to market," said Clark Robertson, assistant vice president, regional development at CSX. CSX introduced the Select Site program in 2012 to better serve new or existing customers on its network. CSX partnered with The Austin Company, a nationally-known site selection consulting firm, to screen candidate sites and assist communities with the application and certification process. The Ocala / Marion County Commerce Park is a 489-acre industrial park adjacent to Interstate 75. An 83-acre parcel on the eastern edge of the park has been designated as a CSX Select Site, as a planned rail spur will connect this parcel to the Florida Northern Railroad's mainline, located just over one-half mile east of the site. "The investment by both the City of Ocala and Marion County to bring a four-lane roadway and utility infrastructure to this property made this Select Site designation possible," said Jonathan Gemmen, senior location consultant with The Austin Company. "The future for rail-oriented job creation in and around Ocala has never been better," says Tom Owen, vice president of marketing and sales for the Florida Northern Railroad. CSX's short line partner, Florida Northern Railroad, will provide local service to the Ocala / Marion County Commerce Park. The Ocala / Marion County Commerce Park is the first site in Florida to be designated as a CSX Select Site. "This designation enhances our ability to be globally competitive for rail-served manufacturing and distribution projects," said Kevin Sheilley, president of Ocala / Marion County Chamber and Economic Partnership. To receive CSX Select Site designation, the location must meet a rigorous list of criteria, including infrastructure and utility availability, environmental reviews, appropriate zoning and entitlement, rail serviceability, proximity to highways or interstates, and other attributes. Once certified, the sites are featured on a new user-friendly web portal that includes press releases, promotional materials and direct marketing to site selection professionals. The FNOR is owned by Pinsly Railroad Company, one of the oldest short line railroad companies in the United States. Pinsly remains focused on growth that it achieves by maintaining a focus on the needs of its customers and by developing strong partnerships with the communities it serves. 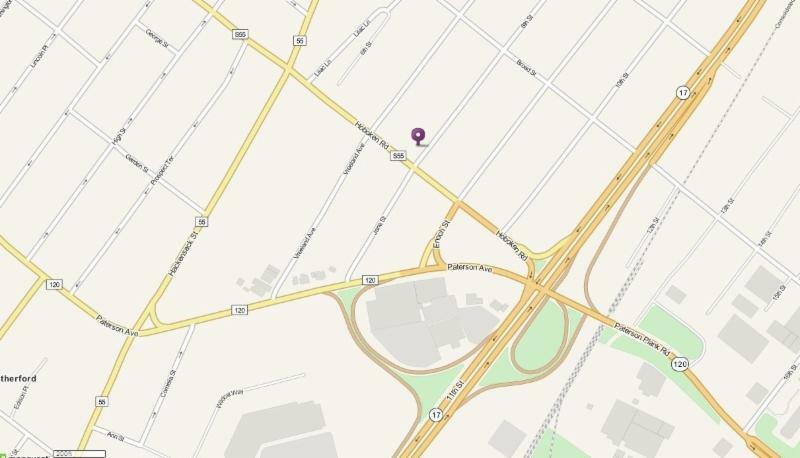 Pinsly's subsidiary, Railroad Distribution Services, provides warehouse, reload, and distribution services. CSX Transportation participates in every carload handled by Pinsly's rail subsidiaries. More information about Pinsly Railroad and its subsidiaries is available at www.pinsly.com. JACKSONVILLE, Fla. - March 4, 2015 - CSX (NYSE: CSX) Chief Financial Officer Fredrik Eliasson today discussed the drivers of a decade of strong financial performance for the company, updated its first-quarter market outlook and discussed earnings expectations for 2015 at the JP Morgan Aviation, Transportation and Industrials Conference in New York City. At the conference, Eliasson highlighted the company's sustained record of superior shareholder value creation over the past decade, which leveraged its network reach and balanced portfolio of business to overcome the global recession and transition in the energy markets. This performance provides a strong foundation for 2015 as CSX expects its merchandise and intermodal markets to continue to grow faster than the overall economy. At the same time, Eliasson indicated that CSX's domestic coal volume is now expected to decline at least 5 percent, reflecting the relatively mild winter weather and low natural gas prices. He also noted that as oil prices remain low, the company expects growth in crude oil shipments to be more moderate than originally expected. "We continue to expect strong earnings growth in the first quarter as merchandise and intermodal customers see growth opportunities and recognize the value and efficiency of freight rail service," Eliasson said. "By leveraging price and efficiency gains combined with expected volume increases, we continue to target double-digit earnings growth for the full-year 2015, though achieving that goal will be more challenging with the expected decline in coal movements." Eliasson also reinforced the foundation of the company's strategy for creating superior shareholder value is delivering service excellence for its customers. That allows CSX to maximize its three key value levers: growing its merchandise and intermodal business faster than the economy, pricing above inflation and driving efficiency in operations. In addition to his long-running Camden & Amboy Railroad Historians FaceBook page, John Kilbride has recently created a Railroads of Trenton page, and is looking to expand their memberships towards the purpose of sharing historical information on those interests!!! Spring is almost here, and that means it's time for Peter Cottontail to visit BR&W! The Easter Bunny Express operates Sunday March 22, Saturday - Sunday March 28-29, and Friday - Saturday April 3-4. Trains depart Flemington Station only. Visit our website for the complete schedule of departures. Reservations are required, and are now available through our website! The members of The New York Society of Model Engineers, Inc., wish to invite you, your family and friends to attend our 89th Annual Spring Model Railroad Exhibition. 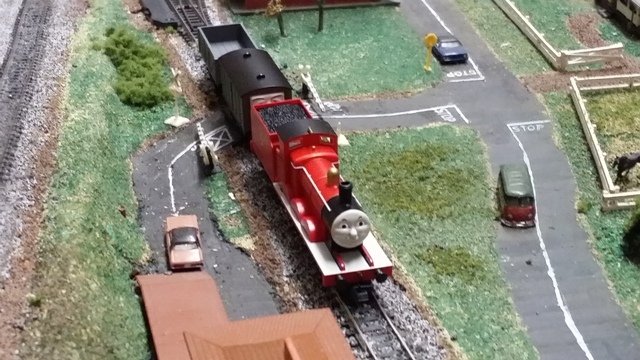 For our youngest fans Thomas and His Friends will be operating during all weekends on our Club's Layouts. Older Model Railroad Enthusiasts needn't feel left out however, for your enjoyment many prototypical trains of various eras, operating signal systems and the country's largest collection of vintage railroad tail signs are on display at our Carlstadt, NJ headquarters. 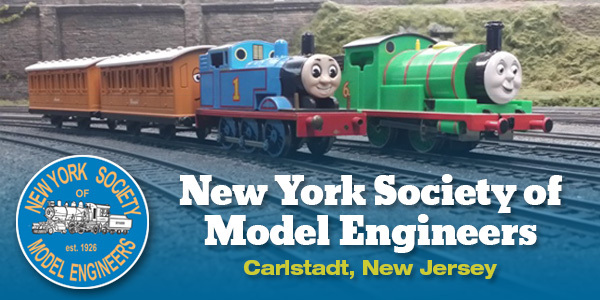 New York Society of Model Engineers, Inc.
Offer Expires 03/29/2015. Printed coupon must be presented in person at the time of admission. Limit 1 coupon per person per day. Don't have the time to participate? We would still greatly appreciate your support. Know someone else who'd like to go? Forward this to someone else. 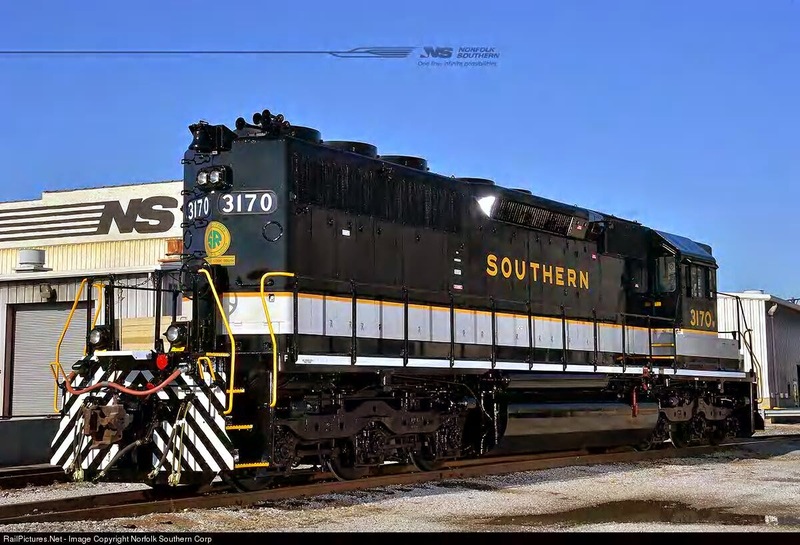 NORFOLK, Va., March 2, 2015 -- Norfolk Southern Corporation (NYSE: NSC) today announced that James A. Squires will succeed Charles W. “Wick” Moorman as chief executive officer. The action by the company’s board of directors is part of its planned succession process and will be effective June 1, 2015. Received a heads-up email from a correspondent in NW Pennsylvania. Except for the ditch lights, no class lights and modern cutting lever lifts, this is just about how she must have looked at La Grange, back in April, 1971! No funky cab modifications, and the honest-to-goodness Southern Railway paint scheme, true to the day she was built...almost 44 years ago. Who woulda' thunk it (not for a museum, but for revenue service, and back from retirement) in 2015? Mind blowing. We have artist Andrew Fletcher to thank for having gotten the spectacular Heritage Unit 'ball rolling' with Mr. Moorman & Co. at NS. allowed to decline and was finally sold off by the railroad in the 1970s. wonderful resource for the community. he graduated from Queens College and St. John's University School of Law. A lousy image is better than no image!